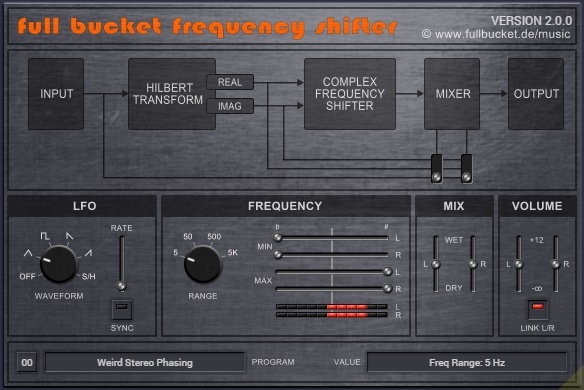 Do not confuse the Frequency Shifter with a pitch shifter! A pitch shifter multiplies all frequencies of the input signal by a constant factor while a frequency shifter adds (or subtracts) a constant amount of Hertz to (or from) those frequencies. Thus, the harmonic structure of the input signal will not be preserved in the modulated signal, resulting in a raw, inharmonic, metallic, you-name-it sound the more you apply the effect. Even more, if you mix a slightly shifted signal with the original input signal you will get some uncommon phasing sound. You may have to reboot your Mac after installing the Frequency Shifter!